IT was a morning 10 years in the making – and the people of Cleveland knew it. In fact, locals were so excited about the reopening of St Andrews Inn that the new owners were, quite literally, overwhelmed. Most arrived an hour early, scones for Devonshire tea ran out almost immediately and tables and chairs needed to be carried downstairs to cope with the numbers. In total, more than 100 people crammed inside the circa-1835 inn on Wednesday morning. One of the new owners, Gillian Mason-Johnson, said it was clear that the St Andrews Inn had been missed during its decade of closure. “It was a learning curve for us today,” she said. The sounds of bagpipes from the RSL Pipes and Drums heralded in the reopening, along with a speech from Northern Midlands Council mayor Mary Knowles OAM. Ms Mason-Johnson said there was also plenty of reminiscing among the guests. “There was a lady who came today whose father was born at the inn,” she said. “We loved hearing all of these wonderful stories. There was so much that I wasn’t aware of. 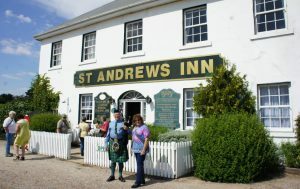 St Andrews Inn had been on and off the market for 10 years and is a landmark on the Midland Highway. It was sold for $600,000 last year. St Andrews Inn will be open from 8am until 3pm with booking essential. Music nights will also be organised, with owners seeking out musicians and a piano.